William Earle is my fourth great grandfather. He was born on April 19, 1794 in St. Johns, Queens, New Brunswick, Canada. 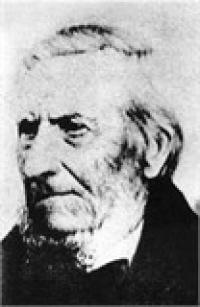 William was an LDS pioneer – at the age of 56, he traveled with the David Evans Company from Kanesville, Iowa to Salt Lake City, Utah. The seventh of January this year witnessed the close of the mortal career of an honest man, and one of the oldest and most faithful members of the Church of Jesus Christ of Latter-day Saints. William Earl, for many years known to the people of Logan as Father Earl, was born in St. Johns, New Brunswick, April 19th, 1794. During the war of 1812 he was called to be in readiness to do duty, but his services were never required. In 1814 he married Sarah Sypher, who is now the surviving member to a marriage contract that was faithfully observed during more than sixty-four years in which they lived together. In 1824 he went to Toronto, Upper Canada, and while there he heard the gospel preached and believing it the true plan of salvation, was baptized by Elder John Taylor in 1837; and shortly after moved to Kirtland, Ohio. From Kirtland he went in 1838 to Missouri, from which place he was driven with the other saints, and moved to Springfield, Ohio, and in 1840, returned to Nauvoo, Ill. He lived six years in Nauvoo and was very intimate with the Prophet Joseph with whom he traveled and slept. During the trouble between the United States and England and soon after joining the Church, Joseph Smith asked him to go into Canada on business. Brother Earl almost refused at first, but was advised by friends, and finding the matter urgent was persuaded to accept the mission. Though the journey was perilous he set out and met with no opposition until he reached the British lines. He had no passport, and when stopped was at a loss what to do. He had almost concluded to turn back, when he remembered what had been said to him by the Prophet’s father – that he would accomplish his mission, and so decided that he would trust in the Lord and proceed. He did not know who commended the British, but remembered a gentleman for whom he had worked in Toronto. Suddenly the thought flashed through his brain and he enquired for Colonel McNabe. The sentry asked if he was acquainted with the colonel, and being answered in the affirmative, allowed him to go on. Once afterward in a like strange manner he passed the lines, and reached his destination in safety. His business concluded he applied to a rich gentleman, an acquaintance of former days, for a recommendation to an officer for a passport. This he received, and arrived home, as had been predicted unharmed. Sometime after that he went with Joseph Smith, Sidney Rigdon and Thos. B. Marsh to Canada, when Elder Rigdon preached in Toronto. He was several times a missionary to the eastern and southern States, and almost to the time of the Prophet’s death was intimate with him. When not allowed to stay in Nauvoo he went to Winter Quarters, from there to Missouri, then to Council Bluffs where he lived two years. Here he fitted out to come west, reaching Salt Lake Valley in 1860 and in March, 1860 came to Logan where he lived till he died. William Earl as a man was noted for great physical strength and endurance, was industrious and honest beyond the average, was a quiet peaceable citizen, and a most fervent devotee of his religion, and was ordained Patriarch some years ago. His faith was unflattering, and he would not allow a doubt to cross his path. The doctrines of Christ to him were the staff of life, and his career well exemplified their teachings. For some time he wished to die, believing his sphere of usefulness was over, and toward the last when night or morning found him still alive he thought it strange and hoped it might be the last. He was sick for about two weeks, and sank quite gradually, not fearing for the end. Of him it might be truly said: “Death had not a single pang in store.” His last speech was one of gratitude to God for life and the blessings bestowed upon him, thanks to all mankind, and an exhortation to his family to be faithful to the end.